Interesting to see the Senso-ji temple without the giant lantern. The Nakamise souvenir shops at the Buddhist temple Senso-ji in Asakusa, Tokyo. In the back the huge Niomon (仁王門) entrance gate can be seen. The first shops were built on this location in 1885 (Meiji 18). They were destroyed during the Great Kanto Earthquake of 1923, but they were rebuilt in concrete in 1925. For detailed information about the Nakamise, read Tokyo 1934 • Asakusa Nakamise. 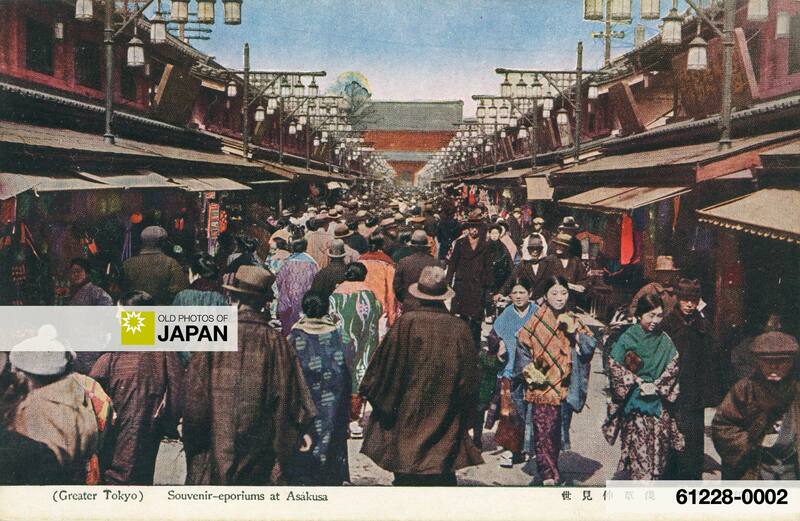 Also see Tokyo 1910s • Asakusa Nakamise. You can also licence this image online: 61228-0002 @ MeijiShowa.com. I want that green Meisen Haori! Amazing that you were able to pick out the green meisen haori! The place looks so much better with all those people in kimono, don’t you think?